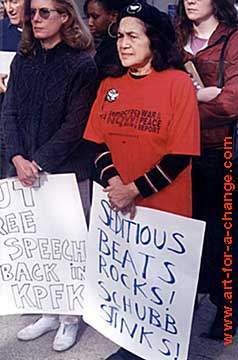 CO-FOUNDER OF UNITED FARM WORKERS JOINS KPFK PROTEST Dolores Huerta, who along with Cesar Chavez, founded the United Farm Workers (UFW), came out to protest KPFK's pulling of the "Seditious Beats" radio program. reference to KPFK station manager Marc Schubb). Ms. Huerta later addressed the crowd of protestors, telling them that she "supports Hip Hop as the voice of today's young people." Huerta emphasized the importance of taking back KPFK so that it truly serve the needs of the people. She further noted that the U.S. Government is today "bombing Afghanistan for 'democracy' while we are loosing our democratic rights here at home."